_ Emphasis on basic conceptual understanding of the content. formulations as per international standards. concepts with their linkage for better learning. the discipline and other disciplines. for further learning in the subject. making and investigatory skills in the learners. _ promote problem solving abilities and creative thinking in learners. the interface of Physics with other disciplines. Frame of reference. Motion in a straight line: Position-time graph, speed and velocity. Uniformly accelerated motion, velocity-time, position-time graphs, relations for uniformly accelerated motion (graphical treatment). Elementary concepts of differentiation and integration for describing motion. subtraction of vectors. Relative velocity. Equilibrium of concurrent forces. Static and kinetic friction, laws of friction, rolling friction. (vehicle on level circular road, vehicle on banked road). comparison of linear and rotational motions; moment of inertia, radius of gyration. parallel and perpendicular axes theorems and their applications. Elastic behaviour, Stress-strain relationship, Hooke’s law, Young’s modulus, bulk modulus, shear, modulus of rigidity. Surface energy and surface tension, angle of contact, application of surface tension ideas to drops, bubbles and capillary rise. Heat, temperature, thermal expansion; specific heat - calorimetry; change of state - latent heat. Heat transfer-conduction, convection and radiation, thermal conductivity, Newton’s law of cooling. Thermal equilibrium and definition of temperature (zeroth law of thermodynamics). Heat, work and internal energy. First law of thermodynamics. Kinetic theory of gases - assumptions, concept of pressure. Kinetic energy and temperature; rms speed of gas molecules; degrees of freedom, law of equipartition of energy (statement only) and application to specific heats of gases; concept of mean free path, Avogadro’s number. Simple harmonic motion (S.H.M) and its equation; phase; oscillations of a spring–restoring force and force constant; energy in S.H.M.-kinetic and potential energies; simple pendulum–derivation of expression for its time period; free, forced and damped oscillations (qualitative ideas only), resonance. from each section) during the academic year. students. The students will maintain a record of these demonstration experiments. 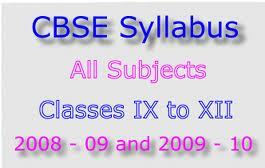 Schools are advised to see the guidelines for evaluation in practicals for Class XII. Similar pattern may the followed for Class XI. 3. To determine radius of curvature of a given spherical surface by a spherometer. 4. To find the weight of a given body using parallelogram law of vectors. second’s pendulum using appropriate graph. 6. To study the relationship between force of limiting friction and normal reaction and to find co-efficient of friction between a block and a horizontal surface. 7. To find the downward force, along an inclined plane, acting on a roller due to gravitational pull of the earth and study its relationship with the angle of inclination by plotting graph between force and sin. 1. To make a paper scale of given least count, e.g. 0.2cm, 0.5cm. 5. To study the variation in range of a jet of water with angle of projection. 2. To find the force constant of a helical spring by plotting graph between load and extension. 3. To study the variation in volume with pressure for a sample of air at constant temperature by plotting graphs between P and V, and between P and I/V. 4. To determine the surface tension of water by capillary rise method. 5. To determine the coefficient of viscosity of a given viscous liquid by measuring terminal velocity of a given spherical body. 8. To find the speed of sound in air at room temperature using a resonance tube by two resonance positions. 9. To determine specific heat of a given (i) solid (ii) liquid, by method of mixtures. 4. To study the effect of detergent on surface tension by observing capillary rise. (i) at its end (ii) in the middle.